Continuing the theme of “traumatic experiences” from last night, earlier this summer I had the distinct experience of viewing the gloriously random trainwreck that is the video for Miley Cyrus’s comeback single, “Can’t Stop” (which this weekend I had verified to me by an actual beach-going teenager as “the song of the summer, because ‘Blurred Lines’ is so overplayed”). It was early or late or I was half-watching teevee or something, so I remember having the sound turned very low. My watch was purely for the aesthetics of the piece (or, I suppose, the lack thereof). Yet even a whisper of the song left an imprint on my brain. It only took one more listen to get the “la da dee da dee” refrain irretrievably stuck in my brain, and after watching the second glorious visual trainwreck that was Miley’s MTV Music Video Awards performance I also was stuck with the throaty “we can’t stop” chorus. We’re talking 24/7 under-the-breath singing here. Constant subconscious replay. Ultimate earworm. At that point I broke down and bought the damn song, and here’s what I realized: it’s actually a pretty interesting song. If you just treat the lyrics like the gibberish they are and listen to the arrangement, it has many interesting little hooks in it – the real performance of the chiming high piano notes, the thrumming fuzz bass, the “la da di” vocal hook, and the way it all evaporates into a brief vacuum at the top of a chorus before it enters on the repeat. Enter Scott Bradlee and The Postmodern Jukebox. Yes, I know they are all over the internet already. No, I don’t care. Have some more. The magic of the Bradlee version of the song is that it strips away all of the obvious differentiators I mentioned above and somehow emerges with an even catchier song. First off, I am a total sucker for anything Motown, and the raw doo wop blend of unison and harmonies from The Tee Tones is a welcome throwback. Second, the time signature – Postmodern Jukebox is in 6/8. For the non-musicians among you, just tap along to it. You’ll find you’re tapping in two sets of three – 1-2-3, 1-2-3. You can’t really make the argument that the original song contains this feel, yet after hearing it in the cover I can track that steady pulse in the original as notes in swing time. I’ve always said that a good song can be stripped down bare. 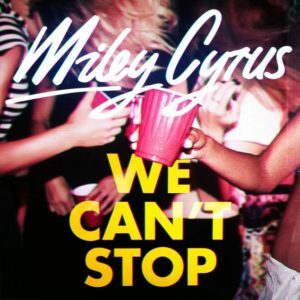 This cover of “We Can’t Stop” isn’t exactly bare, but it had to be stripped down to the basics of the chord changes and melody to build it back up to this point. The fact that it’s even more catchy without the trappings of modern studio production just proves what lovely bones the song has. Not every song on the radio right now would survive the transition – certainly not the tuneless “Blurred Lines.” Buy the Postmodern Jukebox version now!